Anime-influenced animation refers to non-Japanese works of animation that emulate certain aspects of the visual style of anime. Due to Western culture, the term anime has been coined to explicitly refer to Japanese animation. These works are created in North America, Europe, and non-Japanese Asia. With the rise of anime's popularity in Western civilization, it has become an integrated part of western animation produced. In the West, particularly in the United States, the term anime has been generally accepted to describe animation produced explicitly in Japan. As anime became increasingly popular, Western animation studios began implementing some visual stylizations typical in anime—such as exaggerated facial expressions and "super deformed" versions of characters. In particular, works like Teen Titans, Batman Beyond and Spiderman Unlimited displayed some characteristics of anime. Particularly for Batman Beyond, some of its production processes were outsourced in Japan. The advent of anime stylizations appearing in Western animation questioned the established meaning of "anime." There are several Western animators who collaborated with anime creators while producing Western animations. For example, production on The Animatrix began when the Wachowski brothers visited some of the creators of the anime films that had been a strong influence on their work, and decided to collaborate with them. Avatar: The Last Airbender is another example of a Western animation influenced by anime. Though technically not an anime because of its American origin, most fans consider it an anime because both its plot and style are very similar to ones normally seen in anime. One review has commented that "Avatar blurs the line between anime and (US) domestic cartoons until it becomes irrelevant." In addition, Avatar has many features of anime such as having a different color palette from other animated shows. Avatar creators Bryan Konietzko and Michael Dante DiMartino confirmed a particular anime influence in a magazine interview; that of "Hayao Miyazaki, especially Spirited Away and Princess Mononoke" as well as My Neighbor Totoro. Avatar also draws inspiration from the anime works of Shinichiro Watanabe's Samurai Champloo, as well as FLCL (Fooly Cooly) of Gainax. Other various studios from which inspiration was drawn include Studio 4 °C, Production I.G, and Studio Ghibli. [...] Influenced by the poetry and the visual impact of Japanese animation, the series proposes a graphic universe that's particularly original and strong. ^ a b "What is anime?". ANN. 2002-07-26. http://www.animenewsnetwork.com/editorial/2002-07-26. Retrieved 2007-08-18. ^ "What is anime?". AnimeNation. 2006-05-15. http://www.animenation.net/news/askjohn.php?id=1318. Retrieved 2007-08-18. ^ "Ask John: How Should the Word Anime Be Defined?". Animenation. 2006-05-15. http://www.animenation.net/news/askjohn.php?id=1318. Retrieved 2007-08-18. ^ "Ms. Answerman: The Internet Question Massacre". Rebecca Bundy, ANN. 2003-10-17. http://www.animenewsnetwork.com/answerman/2003-10-17. Retrieved 2007-08-09. ^ "What is Animatrix?" feature on The Matrix Revisited DVD. ^ "SciFi Channel Anime Review". SciFi. http://www.scifi.com/sfw/anime/sfw12366.html. Retrieved 2006-10-16. ^ "Avatar: The Last Airbender Article". Animation World Magazine. 2005-02-18. http://news.awn.com/index.php?ltype=top&newsitem_no=13156. Retrieved 2006-12-16. ^ ""In Their Elements." (September 2006) Nick Mag Presents, p. 6". http://www.musogato.com/avatar/magazine/avatarmag1_scan08.jpg. 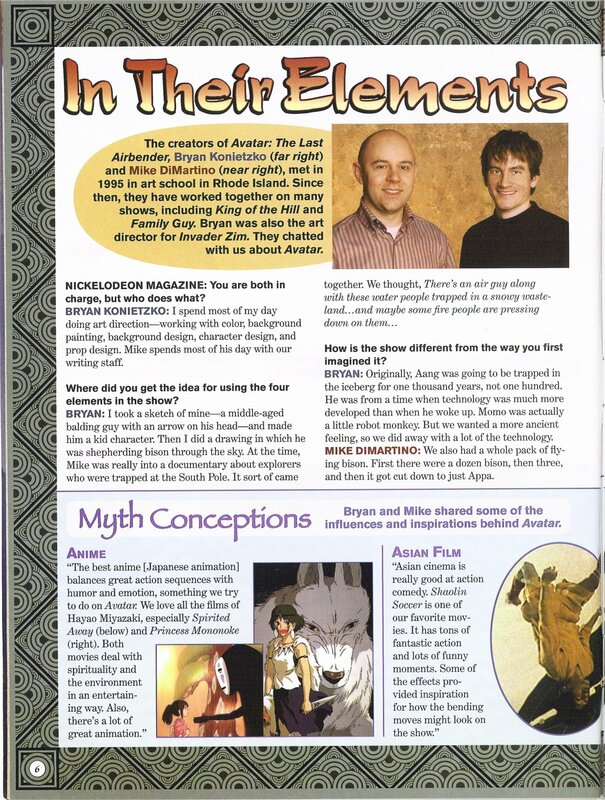 ^ Bryan Konietzko and Michael Dante DiMartino. (2006-09-19). Book 1: Water, Box Set. [DVD]. ^ "Anime Insider: December 2006". http://www.musogato.com/avatar/magazine/anime_insider-dec06.jpg. Retrieved 2007-03-20. Kime, Chad (1997). ""American Anime: Blend or Bastardization?"". EX 3.3. EX.org. http://www.ex.org/3.3/14-column_riap.html. Retrieved 2006-07-29. Khan, Ridwan (July 2003). ""American Anime - Is it Possible?"". Animefringe.com. http://www.animefringe.com/magazine/2003/07/editorial/02/. Retrieved 2006-07-29. "American Anime: Blend or Bastardization?" - American Anime - Blend or Bastardization? ''Exosquad'' - The Original American Anime - Exosquad -- The Original American Anime!